The Game of Humanity is not just about human history — it is also about human nature. Using adaptations of the Prisoner’s Dilemma and similar game-theory exercises, the game challenges players’ notions of generosity, selfishness, gratitude, and guile. Time and again, it shows us that rational individuals do not always behave rationally, even when it seems in their interest to do so. If you and the other tribe both choose to aid, you gain 2 Peeps each. If you both choose to raid, you lose 2 Peeps each. But if one aids and one raids, the raider takes 3 Peeps from the aider. Starting with 5 Peeps, the object is to be the first to 15. You can play against one, two or three other tribes, each of which uses a different strategy. Keep in mind, however, that scores are not saved; closing or navigating away from this page will reset your score. 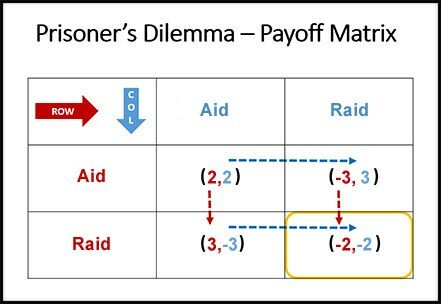 The Aid-or-Raid Challenge is an adaptation of The Prisoner’s Dilemma, a game that tests individuals’ inclinations around cooperative behavior. Each of the tribes in this sample interaction is programmed to respond to challenges according to a different strategy, which you may come to recognize — and take advantage of — as you interact with them. Note, however, that the same tribe may not play with the same strategy in each new game.